We rode our bikes through the Golden Gate Park to the beach at the other end. 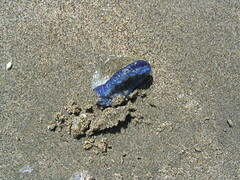 When we got close to the water we noticed these blue jellyfish-like things all over the beach. Pretty cool looking.